Disobedient Objects at the Victoria and Albert Museum looks at currency tampering and politically subversive design (PHOTOS). 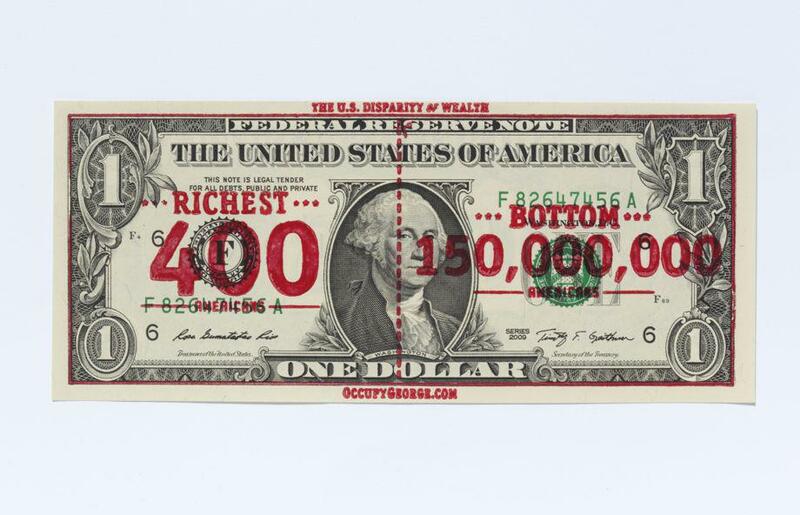 “Richest 400, Bottom 150,000,000,” stamped on a U.S. $1 bank note, designed by Occupy George, United States, 2011. Part of the Victoria and Albert Museum collection. Disobedient Objects, edited by Catherine Flood and Gavin Grindon (V&A, 2014), is being published Saturday in connection with the opening of London’s Victoria and Albert Museum show about how design is used to effect social change. Here at the Eye, the authors share a brief adapted excerpt about the history of defacing currency as an act of political defiance. There is a long history of defacing coins and bank notes in order to slip a political message into circulation. Sometimes this is done as a direct and immediate gesture of graffiti, such as when in a miniature act of defiance Libyans scribbled out the face of Muammar Qaddafi on bank notes after he fell from power in 2011. In other cases there is a more involved design process. 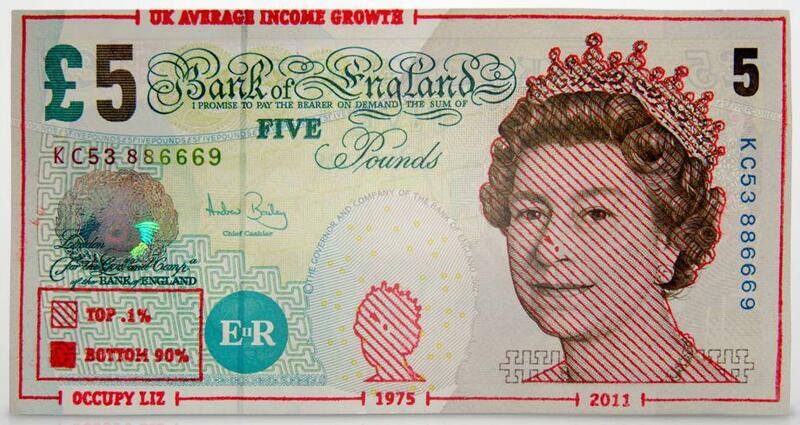 A currency is a highly controlled symbol of a state, and tampering with it is a small but powerful act of subversion. “U.K. Average Income,” Occupy Liz, by Ivan Cash and Andy Dao, 2014. Inspired by the Occupy movement that began in New York City in 2011, artists Ivan Cash and Andy Dao began Occupy George and created a set of fact-based stamps illustrating wealth disparity in America (top image). They could be found stamping the messages onto dollar bills throughout protests in San Francisco, Oakland, and Berkeley. The designs were released on the Internet enabling anyone to participate. The very money that has divided America was utilized to communicate the heart of the problem. In this example it is revealed that the richest 400 people in America have as much wealth as the poorest 150 million. 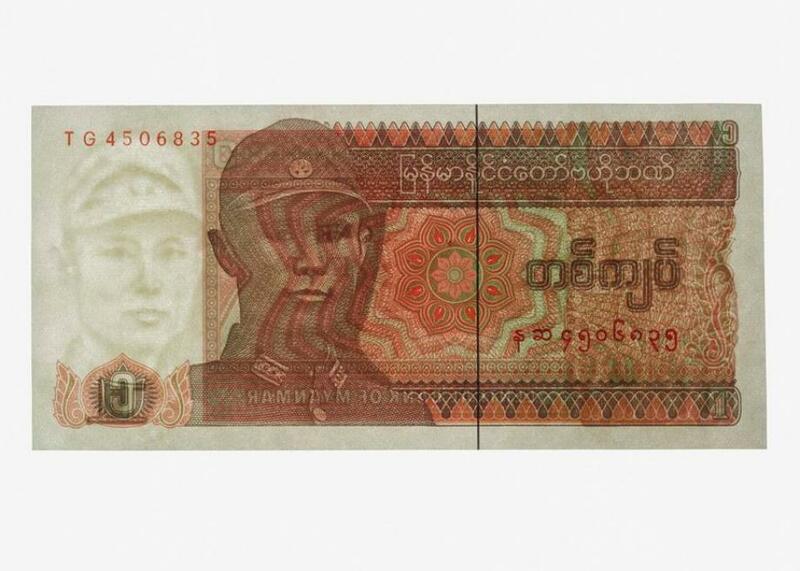 Middle Burmese 1 kyat “democracy note,” 1989–90, private collection. When Aung San Suu Kyi won an overwhelming election victory in Burma in 1990, the military junta ignored the result and placed her under house arrest. Displaying her image, even in private, became grounds for imprisonment. At this time a designer working on a new bank note featuring Gen. Aung San—the father of Aung San Suu Kyi—decided to subvert the commission. In the portrait drawn for the watermark, the features of the general have been subtly softened to resemble the face of his daughter. For a few months before the government realized and withdrew the “democracy note,” people in Burma could hold up their bank notes to the light and see a hidden portrait of the opposition leader. Coin stamped with paramilitary slogan from the 1990s. Stamping coins with paramilitary slogans was prevalent in Northern Ireland from the 1970s and throughout the period of the Troubles, especially in border counties where both British and Irish currencies were used alongside each other. The coins were generally stamped by metal workers and mechanics in their tea breaks as a popular everyday practice of political expression rather than an organized campaign. Two of the Irish coins bear the acronyms of the Loyalist paramilitary group the Ulster Volunteer Force and the Ulster Defence Association. 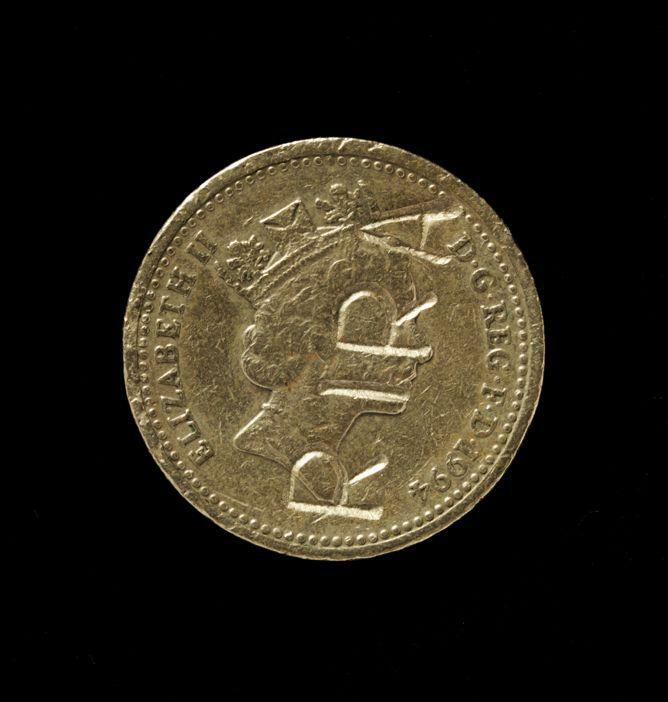 A later Republican example from the 1990s has RIRA, short for Real Irish Republican Army, stamped over the head of the queen on a British pound coin.